It is with great pride that we present this exhibition of works by outstanding African American artists. Included are: Emma Amos, Benny Andrews, Romare Bearden, Murat Brierre, Beverly Buchanan, Jacob Lawrence, Faith Ringgold, and Carrie Mae Weems. Although under the rubric of African American artists, these artists share no artistic program. Each has had a personal voyage and each is of a different mettle. All create with unremitting creative force and passion that issue from their heritage. Emma Amos once said “for me, a black artist, to walk into the studio is a political act.” Amos received her BFA at Antioch College studying fine art and textile weaving. She spent two years in London at the Central School of Art. In the 1960s she came to New York where she became adept at Leo Calapai’s and Robert Blackburns’s printmaking studios. To her credit, she was the only female artist included in the Spiral Group formed by Romare Bearden and his peers. We proudly show art that expresses her excitement about African American heroes (Josephine Baker and the Ostrich, 1984) and her pride in the jazz revolution expressed so profoundly in Harlem (Let Me Off Uptown, 2000). Her art often reveals a bittersweet take on life, always handled with an instinctive command of color. Benny Andrews’ poignant ink drawing (MacDowell Colony/Across the Water, 1974) of a mother standing at the edge of cliff screaming for a son lying across a chasm in a pool of blood, was created 10 years after Congress gave President Johnson the right to do whatever was deemed necessary to defend South East Asia. Those ten years of bloodshed in Vietnam resulted in over 50,000 American servicemen coming home in body bags, others came home disabled, and still others who were captured and put in horrific prisons. Among many of Romare Bearden’s works in this show is “Up at Minton’s (1980), a collage with painted elements for which he was renowned. Because of its beauty and compelling power, this painting was chosen to represent the Bearden Foundation on a picture puzzle and for the cover of their 2005 engagement book. From his very exciting jazz period, it portrays musicians during the Harlem Renaissance who went to Minton’s after their gigs, and played their hearts out by the light of the moon. The collage Maternity/Ancestral Legend (1972) is a majestic Madonna and Child that UNICEF asked to reproduce for a Christmas card at least forty years ago. It has remained one of their most purchased holiday cards ever since. Murat Brierre is considered one of Haiti's principal metal sculptors and the major disciple of George Liautaud. Although he also painted, Brierre chose to concentrate on iron as his preferred medium, because of his belief that metal is imbued with spiritual powers, a central belief of Vodou, Haiti’s national religion. Haitian iron sculpture as represented in our exhibit is a genre whose roots go back to Africa, to those old world liturgical myths and rituals which were melded into Vodou. Originally inspired by ritual needs, Haitian artists, particularly Laiautaud and Brierre, continued to produce objects that represented, mostly in metal, the energies of the Iwa, the spirit of Voodoo. Beverly Buchanan’s shack architecture unifies ideas and material. In oil pastel paintings (Ferry Road Shacks, 1988) and makeshift sculptures of scavenged wood scraps (Coming Home the Back Way, 1991), she created poetic works rich in dignity, and as vibrant as they are deceptively complex. Because she was also a poet, she could passionately evoke the depth and spectra of people, places and a culture that were fast disappearing in the byways of North and South Carolina. Her art was inspired by tenant farmers that could neither read nor write but had children who developed into doctors, lawyers, and all manner of creative adults. Buchanan was born in Fuquay, North Carolina and raised on the campus of the South Carolina State College by her father who was the Dean of the School of Architecture. Since childhood, she always wanted to be an artist. Coincidentally, at thirty seven, a health educator with a master’s degree in public health, she received a letter from Mt. Sinai medical school that she was an alternate for their program. That same day she received the Guggenheim Fellowship and the National Endowment for the Arts Fellowship. No question. Her life was to be lived as an artist. Jacob Lawrence is best known by his socially conscious art. The work on view here, Chess on Broadway (1961), however, is a nostalgic work. As a teenager at the Utopian Children’s House in Harlem, Lawrence was encouraged by Charles Alston to represent ideas in a personal language. The distinctive style he evolved emphasized shapes, lines, and patterns that created movement and emotion although with an angular austerity. An outstanding example of his distinctive artistic approach is beautifully apparent in the drawing in our exhibit. Faith Ringgold is the quintessential story teller and is noted for telling her stories on remarkable quilts. 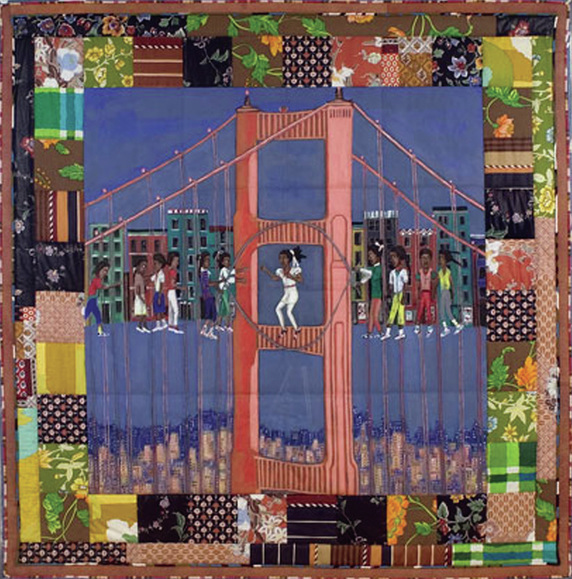 Two wonderful quilts represented in our exhibit are Double Dutch on the Golden Gate Bridge (1988) and Tar Beach (1988). On the Golden Gate Bridge Faith depicts young Black girls playing their favorite after school game but with the streets of Harlem in the background, never to forget where she grew up. Tar Beach was named for the roof top of the apartment houses in Harlem where families spent summer nights cooling off, having supper, playing cards, or just relaxing. This work depicts eight year old Cassie Lightfoot flying over the ice cream factory where her father works and she is assuring her brother that ‘anyone can fly.’ Anyone Can Fly was to become the title of Faith Ringgold’s foundation and indeed has always represented her spirit. Last, we are showing three works from photographer Carrie Mae Weems’ Colored People series, and we are so proud to relate that the Tate Museum in Liverpool borrowed these works for their exhibit entitled Colour Chart. The photographs, limited editions of 3, are Blue Black Boy, Chocolate Colored Man, and Hi Yella Girl. In addition we are including a magical four–part suite from Weem’s Sea Island Series which represents the superstitions of the Gullah people. To research and prepare for this series Weems visited the unique African American folk of the Gullah dialect who inhabit the Sea Islands of Georgia. These are people who were cut off from the melting pot of the mainland and retained a purer version of their original customs, language, games, song and superstitions.